Sharon MacPherson is a songwriter and a performer with a wide range of vocal and performance capabilities. Raised in a musical household in upstate New York, singing was an integral part of her life at an early age. Starting in 2001, Sharon attended The Crane School of Music in Potsdam, NY with a concentration in classical voice performance. As a performer, Sharon has the experience, presence and grace to connect with audience members in venues ranging from cocktail lounges to filled sports stadiums. She has the professionalism and confidence to perform everything from intimate original songs to the American National Anthem at NBA championship games. 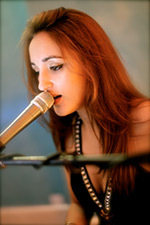 MacPherson left the US in 2011 to tour as the lead singer of the international show band “The Color”, with resident performances 6 nights a week at nightclubs in China, and Bahrain. With high energy performances that left audiences wanting more, Sharon moved to Dubai to pursue her piano, songwriting, acoustic creativity and solo freelance career. Recently Sharon has returned to the capitol region where she performs live with jazz pianist Rob Hunt as The MacPherson Hunt Duo. They are currently available for event booking.